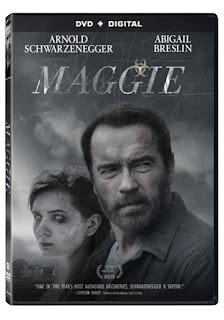 Arnold Schwarzenegger is back and better than ever in the post-apocalyptic story, Maggie, arriving on Digital HD June 30th and on Blu-ray™ (plus Digital HD) and DVD (plus Digital) July 7th from Lionsgate Home Entertainment. The film is currently available via On Demand. Also starring Academy Award® nominee Abigail Breslin (Best Supporting Actress, Little Miss Sunshine, 2006) and Joely Richardson (TV’s “Nip/Tuck,” The Girl with the Dragon Tattoo), Maggie follows the outbreak of a deadly zombie virus that sweeps the nation. As the nation reels from a lethal virus that turns its victims into zombies, Wade's (Schwarzenegger) daughter Maggie (Breslin) has been infected. Now, as Maggie's condition worsens, Wade will stop at nothing to protect her from the authorities seeking to kill her to eradicate the virus. 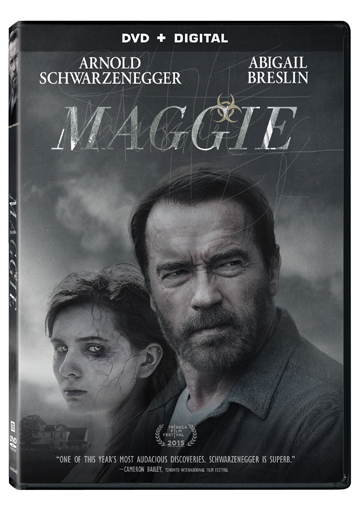 With bonus materials including a “making of” featurette, an audio commentary with the director, a deleted scene and cast and crew interviews, Maggie will be available on Blu-ray™ and DVD.